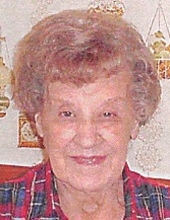 Charlotte Exenberger, age 96 passed away on January 30, 2019. Charlotte was born in Germany on June 14, 1921 to her parents, Joseph and Mary (nee Scheffler) Weiss. She is the beloved wife of the late Leo Exenberger and loving and devoted mother of Ronald and Richard Exenberger. She is deeply loved and will be greatly missed by her family and all who know and love her. The family wishes to express sincere appreciation and thanks to Brookdale Memory Care and the staff members who provided the loving and compassionate care to Charlotte. Friends may visit on Tuesday, February 5th from 9:00 A.M. until the time of the Funeral Mass at 10:00 A.M. at Church of the Transfiguration, 25225 Code Road, Southfield, Michigan. The Mass will be officiated by The Reverend Father Jeffrey Scheeler. Charlotte will be laid to rest at Holy Sepulchre Cemetery. "Email Address" would like to share the life celebration of Charlotte Exenberger. Click on the "link" to go to share a favorite memory or leave a condolence message for the family.